On March 2 AMD is going to launch sales (not including presales already running) Ryzen its new processors, which should knock the stuffing out of Intel. It is also worth recalling that on February 28, AMD will allow bloggers, who will already have these processors start to run in public space online reviews about Ryzen performance processors. This will open the curtain on a practical comparison of the performance of the latest generation of processors Intel Kaby Lake and AMD Ryzen. AMD has promised that the first wave of sales will include not only the most expensive model of processors but also an option for easier. Everyone will be able to choose something for themselves. AMD has set for itself in the development of new processors aim to increase productivity (IPC) by 40% compared to the previous generation, and thus, if not overtake Intel, then catch up. AMD engineers a bit overdone, and exceeded the standard of 52%, then have deserved a good bonus. So, there were built on the architecture of Zen AMD Ryzen processors. 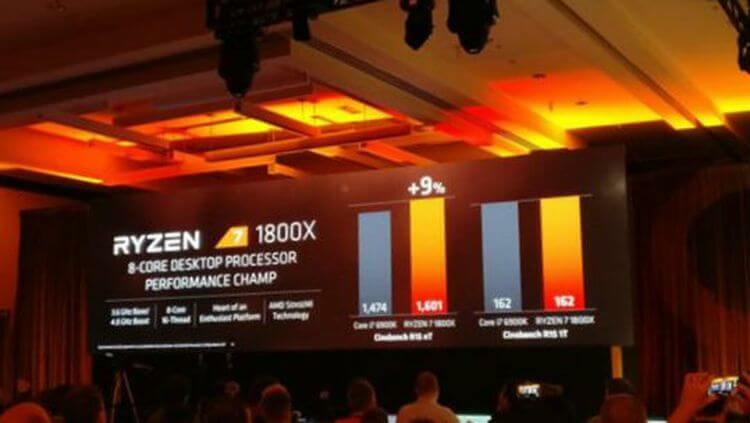 In March, consumers will be presented models of AMD Ryzen 7 is 1700, 1700X and 1800X with 8 cores and 16 threads (2nd instructions per core), closer to the summer are expected to cheaper 6 nuclear and 4-core processors with virtual flows and without. Also, AMD will sell Ryzen processors with boxed cooler for heat dissipation, which will also have a built-in backlight. The processor will operate at a frequency of 3000 Hz sink, with acceleration to peak loads of up to 3700 Hz. This processor will have a record-low power consumption and heat dissipation (TDP) of 65 watts. According to AMD, the processor has 46% output than Core i7-7700K. The processor will operate at a frequency of 3400 Hz and 3700 Hz in the acceleration. TDP level will be 95 watts. According to AMD CPU is 4% faster than the Core i7-6900K and the Intel 39% performance than Core i7-6800K. AMD Ryzen eight-1700H in the CPU Mark test is not far ahead of the six-core Intel i7 6800K, that they have approximately the same cost. 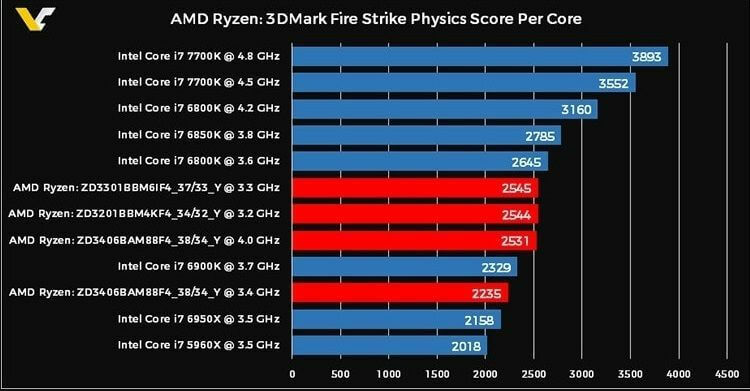 Furthermore, in comparing the performance of Intel i7 6800K core is already ahead of AMD Ryzen 1700H. At the same time, at 3DMark situation is quite different. AMD Ryzen 1700H at 4 GHz, this bypasses the Intel i7 6800K (6-Th cores at a frequency of 4.2 GHz) and Intel i7 6900K (8-NIL cores at a frequency of 3.7 GHz). At the same time, AMD Ryzen 1700H, who collected 20,249 points, almost catching up with Intel i7 6950K (10-Tb cores at 3.5 GHz), collected 21576 points. 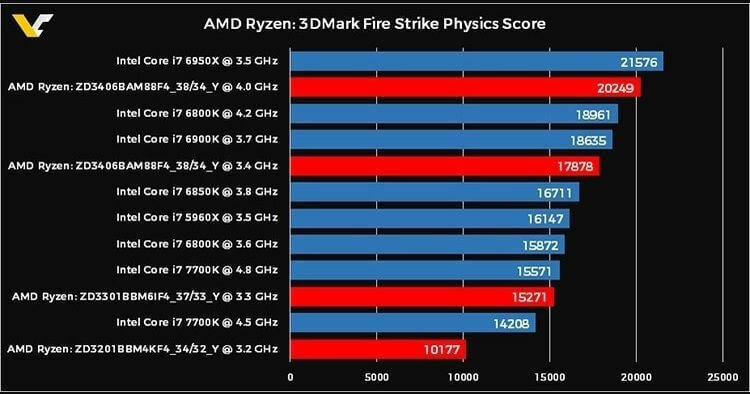 If we talk about the nominal frequency, then AMD Ryzen 1700H on the sink rate slightly behind Intel i7 6900K, while the cost of the first $ 400, and the second about $ 1,100. Cost Ryzen 7 1700X – $ 399. Competitor Intel Core i7 6800K – $ 430. The processor has a maximum performance line. So, it works at a frequency of 3600 Hz and 4000 Hz at acceleration. Level TDP is 95 watts. In a multithreaded test CINEBENCH Ryzen 7 1800X nine percent ahead of the Intel Core i7-6900K, but the single-threaded synthetic test has equal performance. Ryzen 7 1800X price is $ 499, but the competitor Intel Core i7-6900K price is $ 1100. 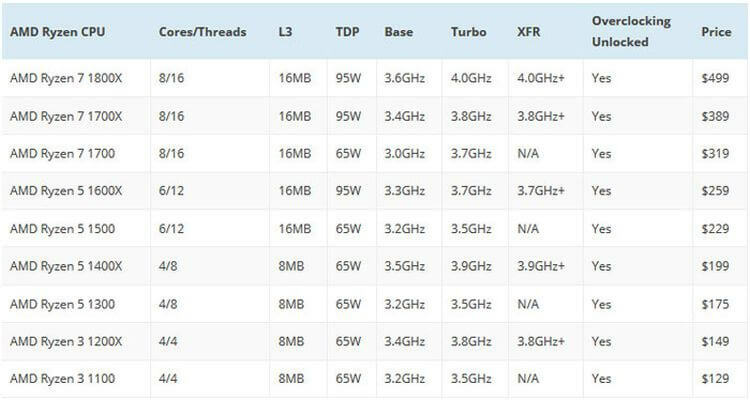 Synthetic AMD Ryzen tests began to appear from the time of sending the new top-end processors bloggers and journalists. How much they believe show real simulation tests. 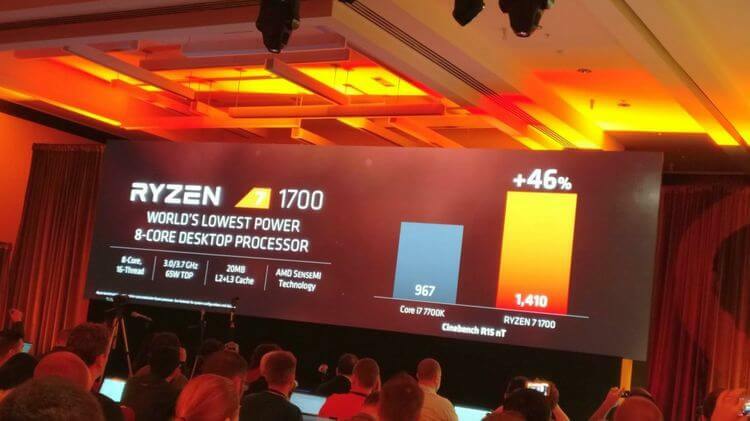 Many enthusiasts have suggested that it will be enough to buy the cheapest model of AMD Ryzen 1700 and disperse it to the top-level. It is worth noting that a top Ryzen 7 1800X already overclocked to 5.2 GHz than set a world record for overclocking. It should be noted that an important part of AMD Ryzen processors is XFR technology (extended frequency range), which increases the frequency of the processor above the established limits. Limitation only for cooling then it is better, the frequency of the processor rises above. Intel i7 processors, in turn, have a built-in graphics core, allowing to work and often play without having to buy a graphics card. At the same time, AMD promises to begin production of processors with integrated video Vega in the autumn of 2017. AMD has promised that the deficit is not only the processors but with motherboards for this type of processors. Some motherboards card manufacturers have already shown their models are compatible with AMD Ryzen. For this new chipset, models were introduced B350, X370, which fully supports acceleration AMD Ryzen processors. Thus, the company Gigabyte Technology has announced about the four models of the parent card (socket AM4): AX370 Gaming 5 (ATX) is $ 195, AB350 Gaming 3 (ATX) is $ 110, AB350 Gaming (MicroATX) is $ 100, and AB350M Gaming (MicroATX) is $ 95. Do not stand aside, and other manufacturers, which also have a wide range of motherboards card for socket AM4.